For any entrepreneur, the primary characteristic or quality that they must possess is the inherent desire to start a business which they truly believe in. Starting and then running a business is by no means a child’s play; it isn’t meant for the ambivalent, the inadequate, or the faint hearted. In entrepreneurship, it is important for an individual to understand that the road won’t always be a bed full of roses. It will be filled with obstacles, hurdles, and thorns, yet one needs to keep pushing themselves forward to achieve their desired goal and objectives. Entrepreneurs need to really be their own boss, translate their vision into reality, and plan ahead to market their products or services. Given the sobering figures and stats on the number of small businesses that start and succumb into the depth of failure, it is imperative for an entrepreneur to have that inherent desire to steer towards success. One pioneering example of such a driven and motivated entrepreneur is Isaac Andy. The Founder, CEO, and Director of iZND Services leveraged his years of experience and skills to establish a name for his company. 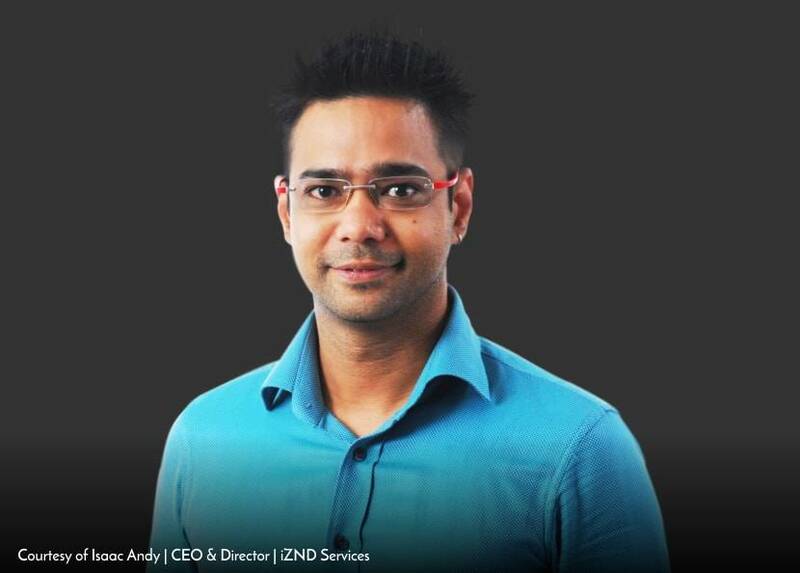 His resolute attitude coupled with his desire to succeed has prompted Beyond Exclamation to take notice and feature the inspiring individual amongst “The Most Successful Entrepreneurs of 2018.” Herein, we highlight the journey of Isaac Andy, his march towards becoming a successful entrepreneur, his portfolio of experience, and the unparalleled services and solutions of his company. To say that Isaac is a versatile and a multi-faceted individual would be an understatement. He holds a bachelor’s degree in BSc (Hons) Computing, Information Systems from the Staffordshire University as well as a Diploma in Computing, Information Systems from the Asia Pacific University of Technology and Innovation (APU/APIIT). He is eloquent in Chinese, Malay, and English language, and boasts hands-on experience as a Database Administrator, Application Developer, and Project Manager across a wide variety of business applications. Isaac is especially interested in client/server and relational database design by using Oracle, Sybase, and MS-SQL Server. He has always been interested in migration-based projects, and has a close-quartered interaction with database manufacturers. Prior to starting his own company, Isaac worked with a number of reputed companies, thereby further honing his skills and knowledge in the field. After completing his education, he joined Parkson Corporation Sdn Bhd as an MIS Executive Analyst Programmer. He followed that up by working as a Technical Manager at Getronics Solution. His corporate experience continued to expand as he went on to work with IBM as the PSS Desktop Technical Lead. He also worked as the Head, Desktop Management for Malaysia Airlines System and as a Technical Lead of CTS Asia Pacific at IBM Malaysia and Project Manager at Solsis (M) Sdn. Bhd. After acquiring a pool of diverse experiences across these companies, Isaac realized this to be the ideal time to move forward and start his own company. A company wherein he can provide solutions which he desires and take his own decisions when it comes to instrumenting solutions. He focused on his dreams and built close relations with various vendors. These vendors were the ones with whom he and his team had closely worked with throughout the years, and supported and assisted each other in every step of the way. At the time when Isaac shared his plans to start iZND Services to the vendors, they wholeheartedly supported him and showed belief in his abilities and vision and extended their products and services to Isaac. This went on to be a big boost for Isaac, as he already had these large corporations as partners of his company, helping him to gain the trust and confidence of its clients. Since then, he hasn’t looked back and has continued to ride on the growth wave of his company. The company provides a managed service program which features a dedicated team of hardware and software professionals. The proficient members of the team specialize in developing services and products that meet the needs and requirements of its customers. iZND Services boasts a broad experience in providing IT-based services, and the company has invested considerable resources to develop a mature Managed IT Services Program, Professional IT Project Delivery, and Cloud Computing Solutions. “At iZND Services we are flexible. Your business gains by reducing costs and complexities, and increasing operational efficiency. We provide our customers with repeatable, proven process that delivers consistent end-results regardless of project scope or client,” mentions Isaac. It is smart move to outsource ones’ core and intricate IT requirements to iZND as it is very easy to lose track of ones’ priorities and spend focus on a particular area itself. It usually starts with issues concerning which servers to buy and what firewalls to install. Following this, the OS breaks down, the security gets breached, and network disruptions become a mundane problem. iZND provides you with a one-stop solution that provides all the necessary hardware or software according to the specifications identified based on a client’s requirements. Most recently, the company became an official participant in the United Nations Global Compact, the world’s leading voluntary corporate social responsibility initiative. Isaac believes it to be extremely important to define ones’ goals for the target they desire to achieve. According to him, obstacles and hurdles will always remain ahead but one can get past the same by addressing, facing, and dealing with it. This will ensure that the next time the challenge comes-forward, it’ll no longer be an obstacle, rather it will be a pathway that you’re more than capable of going through. He mentions aspiring entrepreneurs to take notice of these issues and ensure that each and every one in an organization are clear on the processes that need to be conducted or run. This would make sure that any recurring issues would no longer cause any huge problem. “With all issues out of the way, it will give you & your organization more time & resources to focus on building & improving the necessaries to achieve the long-term goals that you have defined,” claims Isaac. iZND’s services focus on offering one-stop solutions as the company understands that eradicating confusion when it comes to support tools is highly important behind the success of reducing the downtime encountered by an organization. Having all of your collateral aligned to a one-stop solution and support provider streamlines the entire process for distributors to get everything that you’d need. The company promises to manage it all for you; whether it is hardware, software, network, security and backup. Anything and everything can be configured in accordance to your needs at iZND Services. The company has a 24/7 automated helpdesk system, which helps monitor your IT infrastructure to ensure that it runs precisely and to the best of its capabilities.